The BHS Flow Through Racks (FTR-C) improve workflow by providing safe and convenient access to battery stock. Each unit is fully assembled and virtually maintenance-free, requiring no shelf adjustments or retightening of bolts upon arrival at your facility. Phenolic casters allow the rack to display almost anywhere and will not mark up floors. The clean design of the Flow Through Rack allows for live product presentation while providing optimal space utilization. 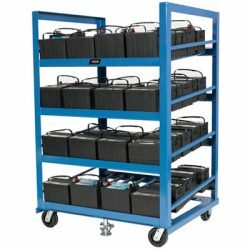 With features like an acid-resistant powder coating and robust locking floor brakes, the Flow Through Rack is designed for long-term durability in various applications. They can hold up to 4,000 pounds (1814 kilograms) and are made with structural welded steel frame and shelves. Spring tension brakes keep your facility safe, and side rails protect your products. The unit fits easily under pallet racks, while its inclined shelves provide for convenient stock rotation. Whether you require a mobile unit for product presentation or a durable storage rack to improve workflow, BHS’s Flow Through Rack offers an excellent return on investment. Contact your local dealer for more information or call our sales team at +1 314 423 2075 for a list of dealers in your area.